The Korean word hobak (호박) is a little confusing because you may hear it applied to either a pumpkin or a zucchini. Actually, it’s a kind of generic term for ‘squash’, and to distinguish zucchini from pumpkins and squashes, some Korean people will call the zucchini ae-hobak. 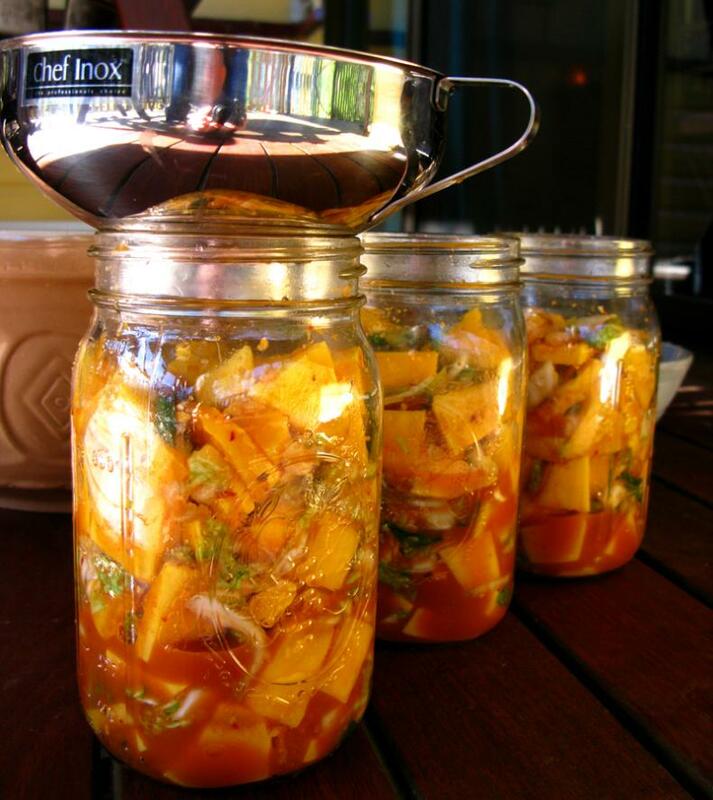 Because we are fermenting here, the firmer, pumpkin-like hobak are used. If you can find a yellow Asian squash, great! If not, anything similar to a butternut squash, or indeed any pumpkin or firm orange or yellow squash may be used for this recipe. I’m not sure of the variety of squash pictured here, but it is very similar to a typical butternut, just not as orange in the flesh. 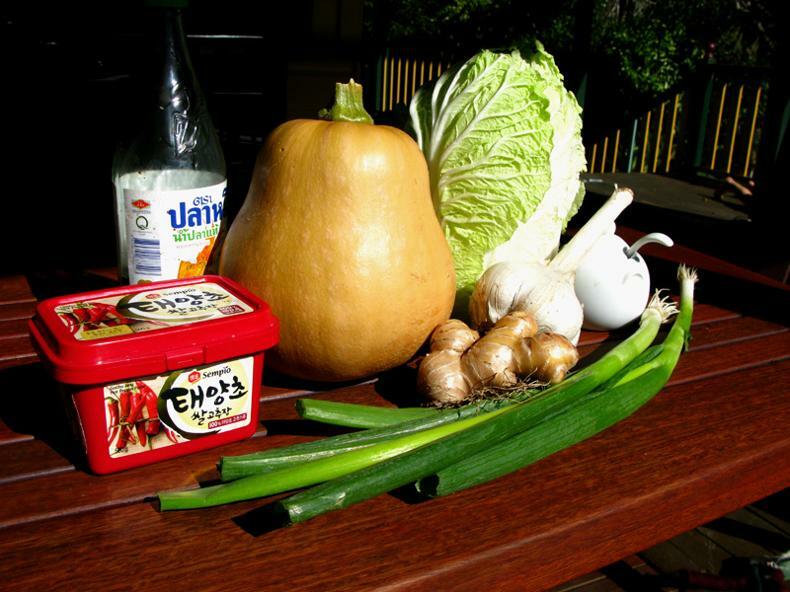 The photo above gives you a pretty good idea of what we will be using, so I guess now is a good time to list the ingredients we will need for this delicious kimchi with a difference. If you don’t think this ferment is a bit special, try entering the term ‘hobak kimchi’ into a search engine and see how many hits you get. Not many, and when you offer this to friends, it’s fairly likely they will never have tasted it before. Thanks to my friend Lance Hancherow for the inspiration, his recipe, which inspired mine, is based on something he found in an old Korean family recipe book. 1.5 kg squash, cut into ‘cubes’ 2.5 – 5 cm x 2.35 – 5 cm x 2.5 cm (approx 3 lb at 1 – 2 x 1 – 2 x 1 inches). After an initial period sitting in some salt, the 2.5 cm (1 inch) thickness will be cut again in half so the thickness is about 12 – 13 mm, or ½ an inch. Take the large chunks of squash (we will cut them in half later), place in a large bowl, and add 3 tbsp of salt. I used Himalayan salt, but good quality sea or rock salt is good. No table or pickling salt please. 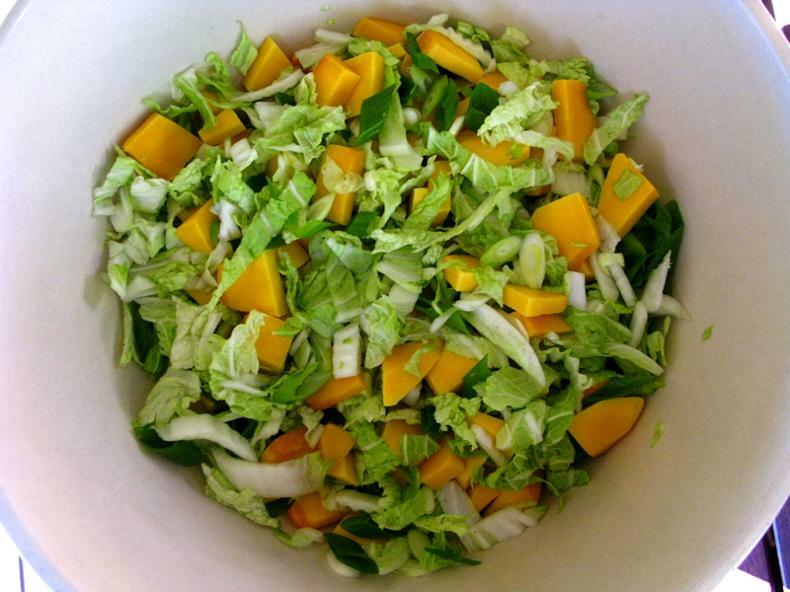 Place the whole wombok leaves over the squash, then cover with muslin or some other fine-woven cloth. Every hour if possible give the squash a bit of a mix up to spread the salt (and the brine that will have formed in the bottom. 8 – 10 hours is an absolute minimum, I did mine for about 20 hours. Glutinous rice flour is the base of this porridge, a standard addition to many kimchi. In 1 cup of cold water, stir in 1 ½ tbsp glutinous (sticky) rice porridge. Turn the heat to low and cook slowly, stirring regularly to ensure the porridge is smooth. When it has thickened in 10 – 20 minutes, depending on the temperature you use, turn off the heat and stir in 1 ½ tbsp of coconut or palm sugar. 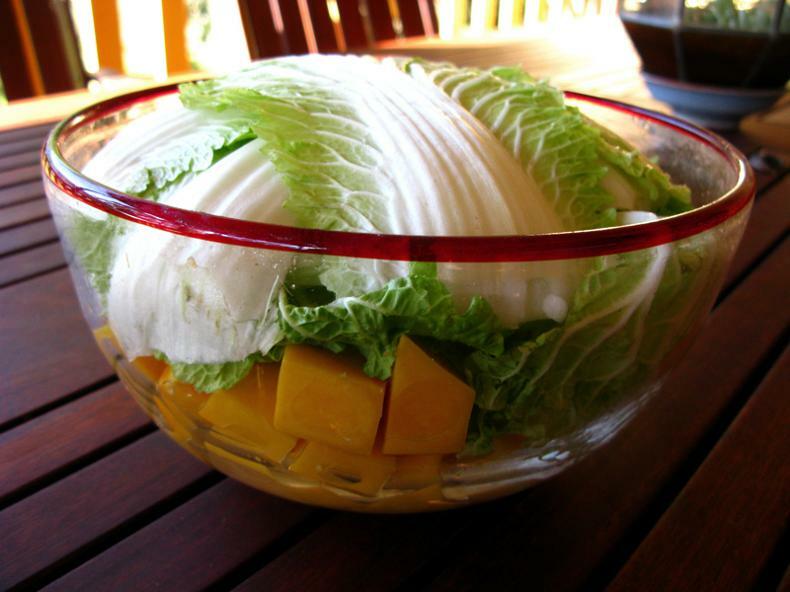 Set this aside to cool, you will want to make this about an hour before you are ready to put together your hobak kimchi. Finely grate, food process, or bullet blend the ginger and garlic. Add to this the gochugaru (Korean chilli flakes, but any chilli flakes will do for a sub), the gochujang (fermented soy-based Korean chilli paste), the fish sauce, and 1 tbsp salt. If you can’t get gochujang, just use double the amount of chilli flakes. Please note the gochujang fermentation is partially activated by a wheat enzyme, and though I would consider this food ‘gluten free’, those with a serious gluten reaction (e.g. anaphylactic shock) should avoid this product. 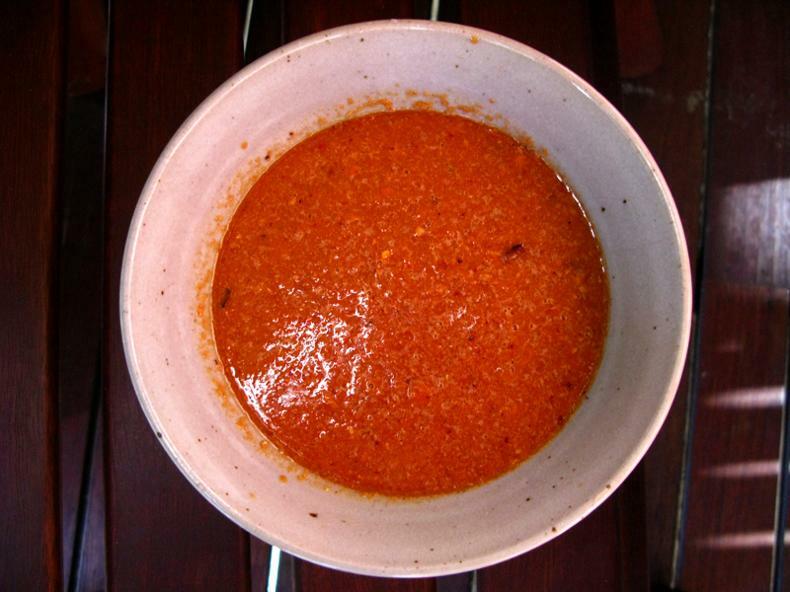 Once the rice porridge has cooled, add it to the spice paste and mix well. I call them spring onions, others call them shallots, and there are no doubt other names floating around out there, but since they are pictured above, we are all on the same page. Trim sub-standard growth, usually the outermost leaf sheath and the very tips, trim the roots, then slice these on the diagonal. A diagonal slice across the fibres, in my opinion, opens up subtle nuances of taste that the straight cut doesn’t. Cut them straight if you like, but I think they are also more aesthetically pleasing when cut diagonally. Take the cabbage leaves off the squash, and shred thinly. Cut the thickened midvein (the white basal material) more finely. When done, add the green stuff to the spice paste and stir well. Pour out all the brine, then give the squash several rinses in clean water. Either allow them to drain for at least an hour in a sieve or colander, or pat dry with a clean cloth or kitchen paper. Take each piece of squash and cut in half at the thinnest edge, roughly giving you pieces 12 – 13 mm (1/2 inch) thick. Once rinsed, dry, and cut, we are ready to put it all together. 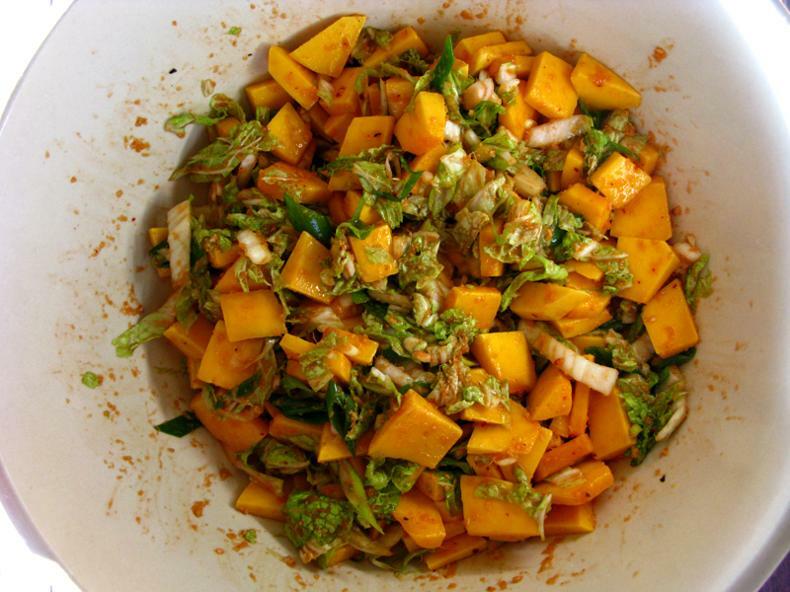 Place the squash in a big bowl, and rub the spice paste with the veg well into the pieces. Every surface wants to be thinly coated with the paste, this won’t be immediately apparent to the eye, but a through mixing will indeed make this so. This is the perfect time to put the energy of love into your food. As you mix with your hands, take your energy into your heart, think of all those you love who will be enjoying this delicious ferment, and send that love out of your hands, and into the food. All the universe is energy, so putting good energy into our food increases its ability to nourish and heal. Even if you don’t believe this, the benefits of entering a meditative state are well documented, so why not? Having said that, most cultures on earth (other than the Anglo-European ones) recognise and promote the benefits of ‘love cooking’. Think back to the meals you have had – which where the tastiest and most pleasing to mind/body/spirit? Those cooked with resentment, or those cooked with love? This is a short ferment, so an airlock is not necessary. Place the mixture evenly into whichever glass or ceramic vessels you are using, and share the remaining liquid evenly between them, and then close the lid tight. Let these sit on the bench at room temperature for 3 – 7 days, depending on ambient temperatures (3 days if it’s hot, 7 days if it’s cold). Rotate them, flip them, stand them on their lids or shake them regularly to distribute the paste over all the pieces. As you can see, the amounts given filled 3 x 1 L capacity Ball jars. Monitor pressure of the jars by pressing down on the lid. If pressure feels excessive, give the lid a quick turn until you hear a hiss, then tighten immediately. 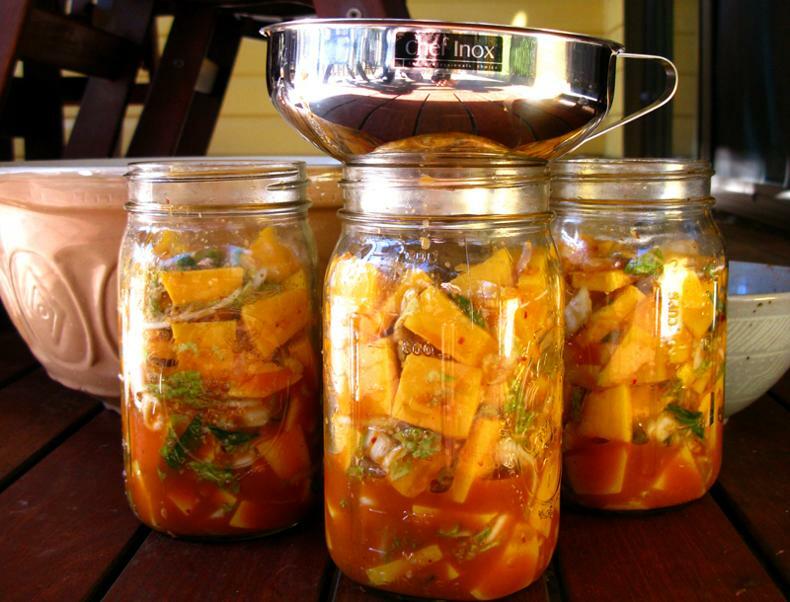 Once these have fermented on the bench, place the jars in a root cellar, cool pantry or fridge. 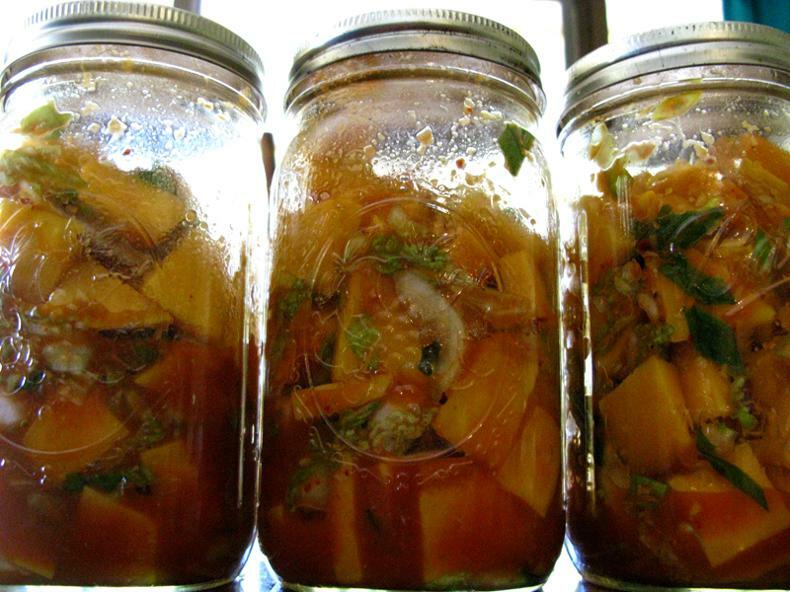 Squash ferments are quick to soften and slime, make this is small batches, and eat quickly. There should be no problems with the eating quickly part, this is delicious. Enjoy!